Some site cross all kinds of boundaries, mixing text, illustrations or graphics, and motion content. 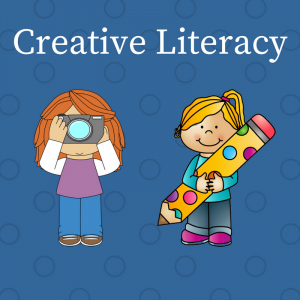 They also offer tools and ideas that go beyond language arts to incorporate literacy and learning across other disciplines. Rather than try to parse it by one medium, we’ve created a page all their own! Got more suggestions? Find broken links? Email us. 100 Incredibly Useful YouTube Channels for Educators – You’ll find links to everything from National Geographic and the various Smithsonian institutions to the CIA (Culinary Institute of America) and the Anaheim Ballet. 1001 Fonts – A site that allows you to download fonts (a lot are free). Adding new, fun, or silly fonts can be a great way to engage kids in writing. ABCya – This site describe itself as the place “where education and technology meet.” There’s a lot of fun lurking here, as well as opportunities for children to develop skills. The games and activities were all developed by teachers and cover Kindergarten to Fifth Grade. Blabberize – Speak through a picture by recording your voice and moving the mouth on the face of the picture you have chosen. Read more at The Book Chook. Cool Tools for Schools – This comprehensive collection of Web 2.0 tools for classrooms offers lists of tools for any type of classroom work, from research, collaboration, mapping, and polling to music, audio, and presentation tools. Create a Graph – Very simple, kid-friendly tool for creating graphs and charts. Edublogs TV – the video hosting site dedicated to education. Into the Book – Offers resources and activities to help increase children’s comprehension and reading skills. An excellent site for children, teachers and parents. Keep Vid -This free converter site allows you to convert something like a You Tube video into a format that you can embed in other programs such as Powerpoint. Lyrics Training – Practice a foreign language by filling in blanks from song lyrics. Suited more for older children. See the Book Chook review. Notefish -This is a free web tool that allows you to create and save research notes from the web. So for example, if you’re taking a trip and you’re checking out travel sites, tourist sites, flight info, etc, you can save links, pictures and text all on one Notefish sheet. There’s a download bar that integrates it more into your system. PDF On-line – This free PDF converter makes it handy to convert your Word or Pages files into PDFs. It’s easy to convert on the Mac because it’s built in, but on PC’s it’s not as easy. Rollyo – This is a website compiler. You can create an account and then roll your own search engines. This one does have ads to it, so you have to be a little more careful. Basically you can put together up to 25 websites and give it a search engine label. Then when you conduct a search under that search roll, your keyword search is only going to those sites. For example, I love to bake, so I made one with all my favorite baking sites. Instead of having to check each one individually for a certain search, I can search them all at once. Again, you can also look up other people’s search rolls. Rubistar – This site for teachers is filled with free tools to build scaled rubrics for assignments. Scratch – A free online software tool for learning introductory code and sharing projects for novices and advanced coders. It uses block-based command codes that are color-coordinated by their function. There are also options for collection tie-ins with numerous books (like this one or this one) that teach new tips and tricks for navigating Scratch. Spell with Flickr- A simple way to focus on visual literacy. Once you follow the link, just type a word into the box marked “spell”. Press the “spell” button and it grabs images from Flickr to represent each letter you typed. If you are not happy with a letter offered, simply click on it to change it. Starfall – This site offers lots of free content, from coloring pages to drawing, and more. There are “low cost” tools available, but there is plenty that you can just download at no cost, too. Teacher Tube – Most school districts here block a portion of the web including You Tube. Teacher Tube is an alternative. You can find a lot of education screencasts and videos for educational use. Track Star -You can compile a list of quality, chosen websites into a “track.” This shrinks the web when you’re having students/kids researching on-line so that they aren’t just going to Google and getting all those irrelevant or indecent or junk hits. You are also able to search other people’s tracks so that you don’t have to re-do the work. The sites are checked for decency, although not necessarily quality. Wacky Web Tales – Kids type in their own words according to the template, then generate a strange story of their own. A little like Mad Libs,it gives them a chance to practise parts of speech. Wordle – A toy for generating “word clouds” from text that you provide. The clouds give greater prominence to words that appear more frequently in the source text. You can tweak your clouds with different fonts, layouts, and color schemes. The images you create with Wordle are yours to use however you like. You can print them out, or save them to the Wordle gallery to share with your friends. Zoomerang -Use this free tool to create on-line surveys. See also Writing Help, Vocabulary Building Sites, and Word Games in the 21st Century.